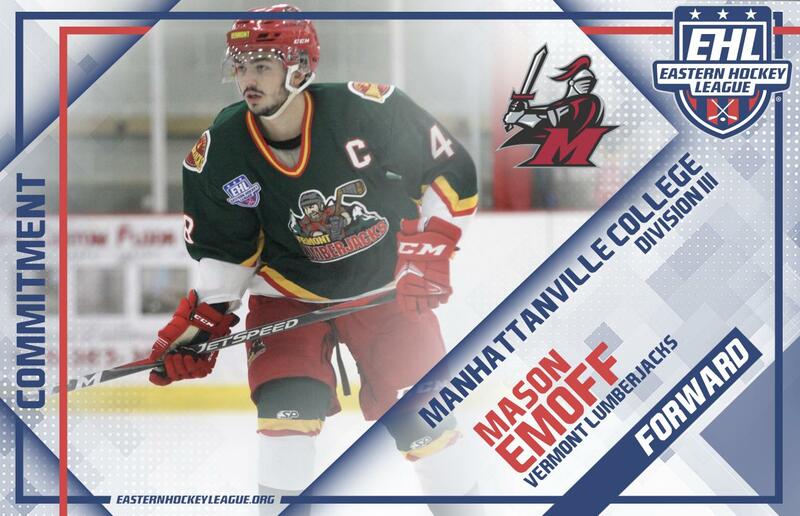 BURLINGTON, VT -- Mason Emoff, a forward for the Vermont Lumberjacks, has committed to Manhattanville College for the fall of 2019. Emoff is in his third season of junior hockey, and second with the Lumberjacks organization. The '98 native of Ontario, Canada played for Vermont's team at the Eastern Hockey League Premier (EHLP) level back in the 2016-17 season, and this year is his first season at the Eastern Hockey League (EHL) level. "Coaching Mason has been one of the most rewarding experiences I’ve had in hockey," said Lumberjacks head coach and general manager Jim Mosso. "He is the kind of person who inspires everyone around him to be better. He helped me create a program with a one of a kind culture. I couldn’t be more proud to see how many schools wanted him this year. Manhattanville is the perfect fit for him. I know they will be lucky to have him." Looking back first on Emoff's year in the EHLP, and the talented scorer tore it up that season, tallying 106 total points for the Lumberjacks. After a campaign in the Central Canada Hockey League (CCHL), Emoff returned to Vermont, this time at the top level. To date this season, Emoff has notched 47 points through 39 total games. Emoff is proud of the way he has developed throughout his junior career, and is beyond grateful to have returned to the Lumberjacks. "I couldn’t have asked to be a part of a better team for my final year of junior hockey," said Emoff. "Along with a great group of guys who have made my experience amazing, I'm thankful to be coached by Coach Mosso. He does an exceptional job both on the ice and when it comes to showcasing his players. He went so far out of his way to help me find the perfect fit for college and I could not be any happier." Emoff and the Lumberjacks have gone 10-1-0 since returning from the holiday break in January, and they are 14-3-0 since Thanksgiving. The stretch has helped Vermont advance all the way up to 4th place overall in the New England Conference. This weekend, the Lumberjacks travel to Tewksbury, MA for a pair of games against the Boston Jr. Rangers, as the two-game series may determine who has the home ice advantage in the First Round of the EHL Playoffs.